Red tape. Paper pushers. Bean counters. Vast, cookie-cutter buildings with fluorescent lighting and thousands of file cabinets. This building in Washington, D.C., houses the Bureau of Engraving and Printing, a bureaucratic agency. These are the images that come to mind when many Americans think of government bureaucracy. A bureaucrat is someone who works in administrative capacity for the government. How important are bureaucrats and their government agencies in actually running the United States government? According to some, they are the real government — the ones behind the scenes who go to work when the politicians are enjoying the spotlight. Max Weber is known as the founder of modern sociology. Max Weber, a German sociologist was one of the first people in modern times to think seriously about the importance of bureaucracy. The term actually comes from the French word "bureau," a reference to the small desks that the king's representatives set up in towns as they traveled across the country on king's business. So bureaucracy literally means "government with a small desk." Weber wrote about Germany during the early 20th century, when developing capitalism was spawning more and more large businesses. 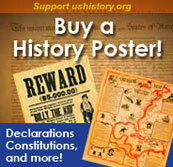 The changing economic scene had important implications for government. Weber saw bureaucracy as a rational way for complex businesses and governments to organize. He did not see them as necessary evils, but as the best organizational response to a changing society. Weber emphasized the importance of the bureaucracy in getting things done and believed that a well-organized, rational bureaucracy is the secret behind the successful operation of modern societies. Observers of the modern American government often point to an iron triangle that best demonstrates who really does the work of government. 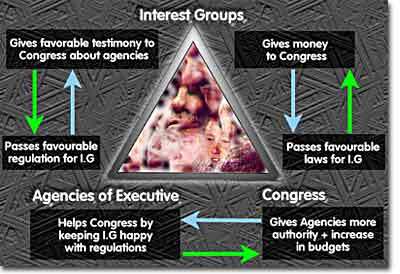 The iron triangle, sometimes called a subgovernment, consists of interest groups, members of congressional subcommittees, and agency bureaucrats. Who really governs the United States? Many political analysts believe policy is set by the participants in the "Iron Triangle" rather than elected officials. According to the theory, agencies and departments usually keep close contacts with interest group lobbyists who want to influence their actions. Interest groups may provide valuable statistics to government agencies, and they are motivated to have their point of view heard. Both lobbyists and bureaucrats value contact with congressional subcommittees that shape the laws that govern their interests. Working together, these three groups set most government policies. An example of such an iron triangle would be the American Association for Retired People (AARP), the House Subcommittee on Aging, and the Social Security Administration all working together to set government policy on Social Security. Advisers, bookkeepers, secretaries. So, it is not only the famous people — the President, the Chief of Staff, the Speaker of the House, or the Senate Majority Leader — who make the real decisions in government. Often, the real players in government are the agency bureaucrats — the people behind the scenes. The Consumer Product Safety Commission recalls hundreds of toys because they don't meet safety standards.